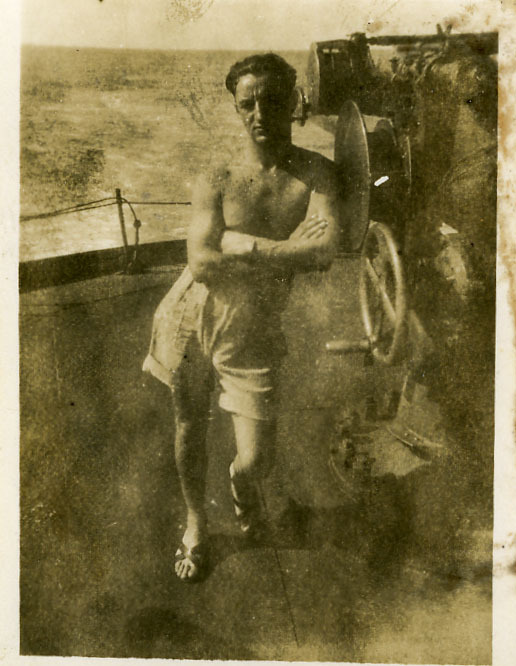 Mr. Walter MacNab, now age 92, was DEMS* gunner on Abbekerk during her last voyage. He found this website and contacted me. Walter still remembers his time on Abbekerk very well and I am very grateful for all the details that that fills in a lot of gaps in my fathers and Abbekerk’s story. Since Abbekerk’s stay at Singapore and Oosthaven still surrounded by ‘mysteries’ I asked him what he remembered of those weeks early 1942. ” Yes, we were in Singapore about three weeks but I must honestly say I do not recall much bombing, probably because we were anchored far from the shore. Indeed we went ashore several times for a break from the ship and spent the night in the Toc H club. We also spent some time at the Raffles Hotel enjoying the dancing which was quite exotic compared to ship life! Perhaps we were just lucky! (..) What is certain is that one day, with many barges round the ship in various stages of loading, orders were given to stop loading, the ship’s pumps were turned on full blast and the barges were sunk. The hatches were shut and the ship made ready to depart but not before a batch of military come aboard. They were evacuated from Singapore because the Japanese had moved in to take over. They subsequently went ashore at Sumatra at the same time as Lt. North’s group. We did not sail in convoy from Singapore: the ship made off at full speed to avoid any problems with the Japs. I’m still in contact with Walter and I’m very glad for for all the time, the stories and information he is giving me! I visited Walter late autumn 2009 in his house in Folkstone. It was a memorable day. We talked a lot about his live on Abbekerk and later when he was stationed ashore. I only stayed half a day and in retropect its amazing how he managed to tell all the storyâ€™s he did in the short time I was there. Story’s about the cockroach infestation that they were unable to stop because they never stayed in port long enough for a thorough extermination cycle, thus creating a habit of always keeping food and drinks closed. 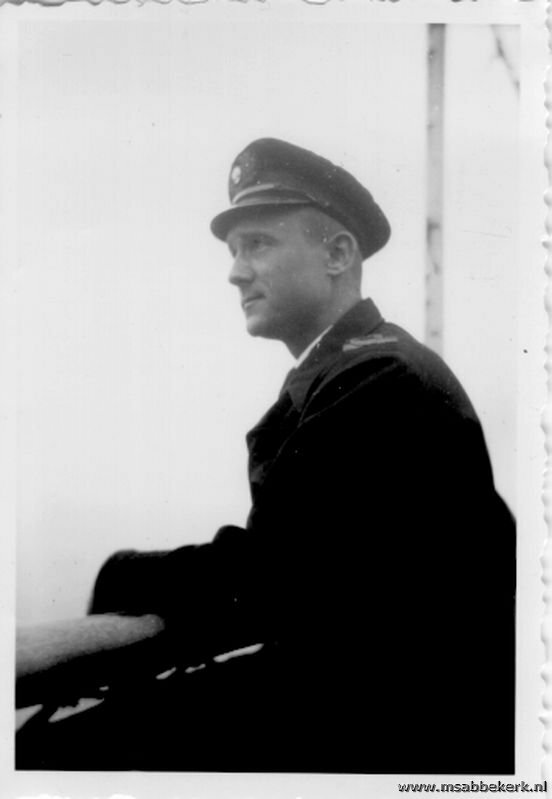 About him running to battle stations on the bridge after the first torpedo hit, only to be thrown into the sea by the blast of the second torpedo. About the quite exhilarating way the survivors were transferred by lifeboat from the Wallflower to a Destroyer with neither vessel reducing speed. The tears in his eyes when he recalled being handed a letter from one of the soldiers that left Abbekerk at Sumatra. He delivered the letter to the soldiers wife in England, but the soldier was never heard of again. About spending a evening off at the Raffles Hotel and Toc H club enjoying dancing and having a good time while – in hindsight – Singapore was on the brink of collapse. I will write down some of these story’s on the website on a later date. After my visit I stayed in contact with Walter by email. I was very sorry to hear he passed away February 5, 2015, 93 years old. : DEMS: Defensively Equipped Merchant Ships. Merchant ships during the war were equipped with guns for defence against submarine’s, surface raiders and aircraft. These guns were usually party operated by trained members of the crew and partly army and navy gunners stationed on the ship. But especially at the beginning of the war the defenses of merchant ships were poor.